See The USA, in your Chevrolet!. The plan last fall (1999) was that we needed a minivan, given that another short guy was moving in with us soon, and that we were going to the convention. After thinking about the problem for a bit, Ellie and I agreed that we should consider a Greenbrier. For once, we decided to buy a used vehicle that was in good shape rust wise, and that ran and didn't really need a lot of work before making such a trip. Since then, I've been pestering VV with various FC questions since although we did buy a pretty solid van, it was still in need of a zillion little things. The fun part was telling other people about this plan. It being our tenth anniversary, I would say "We're going to Florida in our minivan for our anniversary". This usually got a positive reaction, until they thought about the presence of an 8 month old in said minivan. Then they found out what kind of minivan it was, and that we were going to a Corsa convention. At which point the consensus was that Ellie was either mad or a saint. Oddly, I never was considered for sainthood. Anyway, on Monday the 17th, we loaded up the family and our considerable pile of "stuff" and hit the road. 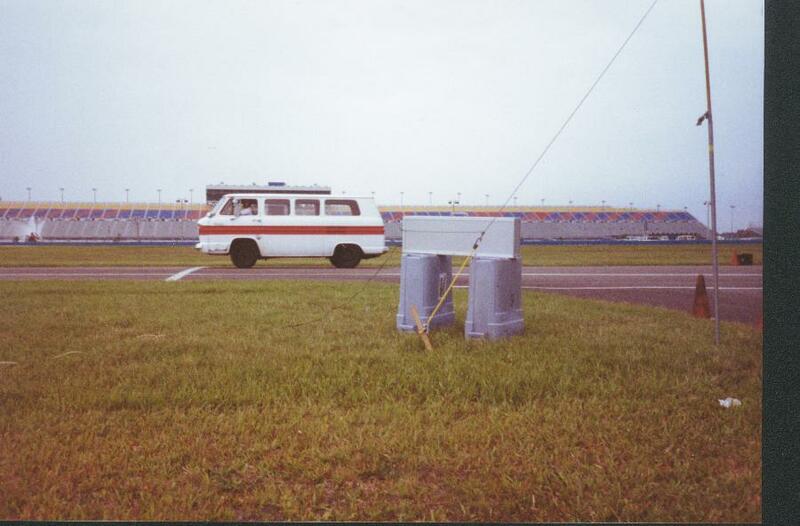 With all the things that we'd done to the van, we'd not gotten it out on the highway and really run it hard. 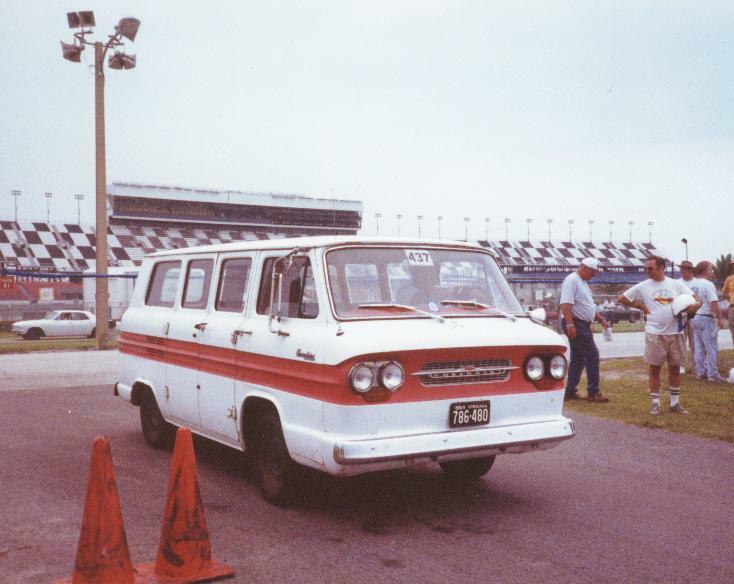 We found out in the first 65 zone that the van was only good for about 68 MPH, and it really didn't climb grades as well as it should. Then, about 100 miles into the trip, something let got in the accelerator pedal. We stopped at the Petersburg, VA civil war battlefield for lunch and some diagnosis of the pedal problem. Turned out the late FC's use a ball and socket assembly and the joint had popped apart. Snapping it back together and we were again on our way. The question was, were the doubters right? Would we be competing for the hard luck award? Also, I had this odd feeling while we were there, kinda deja vu thing. Hmm. So, we criused down I-95, got a few waves and thumbs up along the way, at our almost full throttle 68 MPH. Unlike most other travelers, we were stopping every 150 miles or so for baby maintenance. Good news was the GB wasn't using any trans fluid, and a reasonable amount of oil, turned out to be one quart for the 900 mile trip. Because of the high maintenance nature of our shortest passenger (Brenden) and our desire to stop at interesting things along the way, we split the trip into two days. Day #2's lunch stop was at Midway, GA, home to two of the three Georgia signers of the Declaration of Independance. We had lunch under some big pine treees, on a sunny day with a nice breeze blowing, and I had that odd thing going around again. It was the old Chevy jingle "See the USA, in your Chevrolet!". 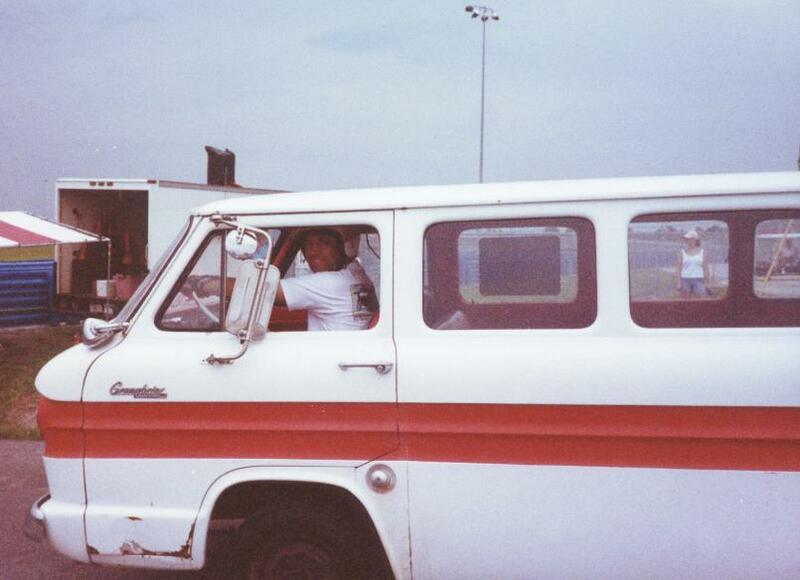 Yup, that was it, here we were in our 36 year old minvan with the family and our picnic basket, seeing the USA on a lovely summer day. Couldn't be beat. A day to remember, eh?. So, on to Daytona! 3 miles into Florida, the Brier's odometer turned over to all zeros. I guess if you're a Corvair, you couldn't do much better than starting your second 100k enroute to a Corsa convention. Got to the hotel, then drove over to Orlando and picked up my mom at the airport. Wednesday we registered, and scoped out (read, bothered incessantly) the vendors. Also, I had taken out an ad in the convention program for our anniversary, so I sneaked a peek at it. Ellie caught on to the "up to something" grin, but I was able to keep from telling (she always looks through the program). Wandering around the hotel, it was *full* of Corvairs. Just about every body style, color combo, stock, custom, race car, you name it, there was something for everybody. Thursday was the concours and car display, and boy it was impressive. Both fields were huge and this was the best time to see the cars in one place. Since we're new to FC's, we spent more time than usual looking at them, to see what others have done and talk to the owners. Stefan and Trevor spent their time wandering around taking pictures of turbo engines, they really liked Allen Bristow's Spyder, got several photos of it. I shot pics of the race cars for my web site, too. On the way over we gave a ride to the Marlow's, and Bob gave us a bunch of tips and advice (I had consulted with him quite a bit before, during, and after the purchase). Mom and Ellie took off to do some shopping with Trevor and Brenden, leaving Stefan and I to continue looking over the cars. Ok, so he sat in an UltraVan and played GameBoy after a while and I looked some more. Now Friday was our anniversary, and Ellie liked the present, so we decided to celebrate by doing something special together. That's right, we packed the kids into the Greenbrier, affixed our number to the windshield, and entered the Rally! After the participants meeting, we had some breakfast, and found our parking place was right at the exit point for the event. So far, so good. Turned out the rally was a trivia quiz *and* you had to get the mileage correct, at a cost of 10 points per wrong question and 1 point per tenth of a mile. The basic premise of a rally is that it's kind of a puzzle - mostly for the navigator. The first leg of the the rally was the odo check *and* had some of the questions in it, plus we didn't quite figure out how the mileages had been done right away, so the first mile or so was slightly chaotic. When we came to the light by the water tower, there were several Vairs headed straight, but my navigator told me to go right. 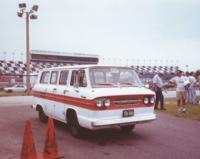 Allow me to explain something - when a team competes in a rally, it is the job of the navigator to do all the real work. It is the job of the driver to be quiet and do what he is told, and not get the team killed in the process. So, I merely pointed out that other Vairs were going straight, but when told the second time to turn right, I did so. Which is a good thing, because half a block on was a course verification, so the other cars' navigators had, um, erred. After that, we settled into a nice tour of the countryside, looking for stuff like arrows on signs, the Metal Equestrian Lounge (Iron Horse Saloon), and roads not to drive on because the owner, uh, well let's just say the owner didn't want anybody driving across his property. We sort of found the checkpoint, it was across from an answer, so I said "let's pull in with all those other Vairs to write it down" and got the ok from my lovely navigator. There we faced the dread trivia questions to be used as tie breakers, so naturally I got the first one wrong. Doh! After that, I did a better job holding up my end of the effort and got the rest right, then we had lunch and headed out on the return leg. Upon our arrival, we took our final mileage reading, then unpacked the kids (remember, we were in the Touring, aka Minivan class) and did our calculations on the mileage. We got a nice boost on finding out that we'd gotten the closest so far - 1/10th off. But, we knew we had at least three or four questions wrong, so we had no real illusions at that point of having won. Saturday arrived and it was time for Corsa to put the "Speed" in the Speedweek. 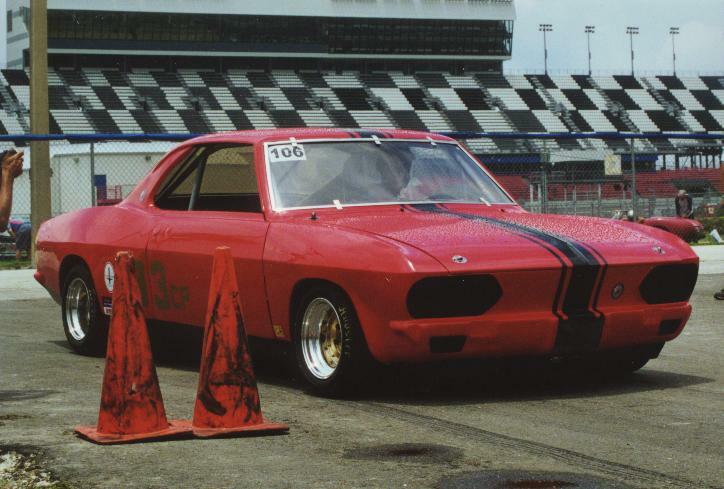 That's right, it was Autocross day! It was quite a sight seeing two big open air garages fill with Corvairs, instead of piling your stuff at the front of the parking space there was a workbench, and even if the predicted rain appeared there was no fear of everything getting wet. Since I was helping out with Tech, I arrived early and got to see the cars unload, then spent the next few hours getting to look over some of the cars for the required safety pieces. This was even better than usual since spectating was more tightly regulated than normal, so working had the added benefit of having free run of the event. On top of that, we had a nice shady garage to work in, and Ellie had brought a cooler with drinks in it for us, so Tech was a pretty pleasant place to be. And did I mention that we got to do it at a world famous track? 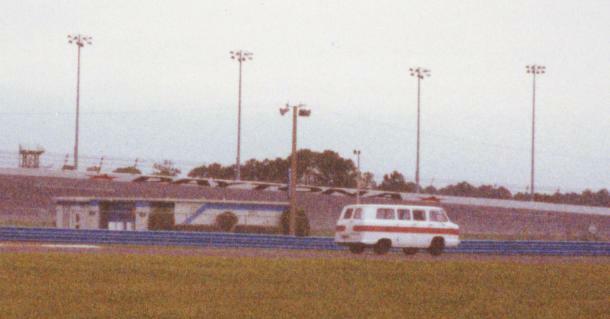 Seeing the Vairs run on the track was quite a thrill, when they came out of the big 180 turn at the far end they ran under the "Daytona" lettering on the wall. The Stock class cars ran first, everybody clean, they really looked great out there. Then came the show we'd been waiting for - Competition, Street Modified, and Specialty. 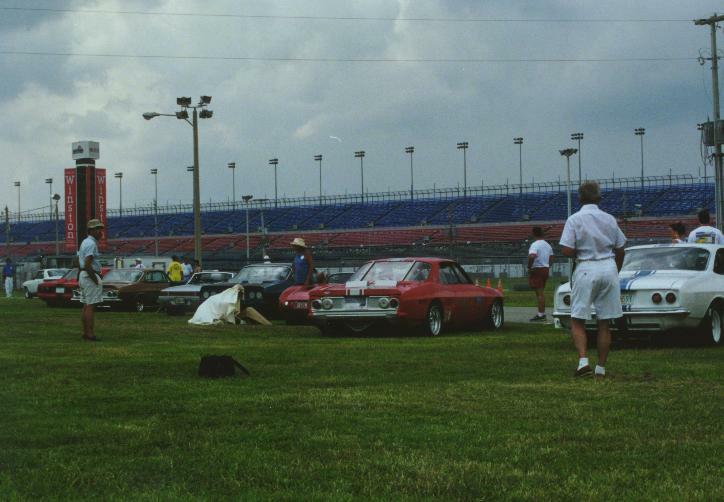 There were several cars in Comp, with Warren LeVeque running first. We'd been used to seeing times in the low 70's, so when the clock tripped at 61 everybody was thrilled. At this point, however, the rain stopped threatening and started coming down. Not a downpour, but hard enough that the track officials said "no cars with slicks". As it turned out, that made for a real shootout as most drivers had only gotten one run in and there were at least five very serious looking Stingers that were competing. After a bit, the rain backed off, and the street tire cars continued running, drying the track. The Comp class cars waited, and waited, you could see the frustration. When the officials declared the track dry enough but with dark clouds overhead, they all knew there might not be another shot so every driver came to the line determined. We watched the times drop - Some low 60's then 59, 58, then Shawn Cousins came off the line hard and turned an awesome 57 that looked like it would stand as FTD. A momentary pause. 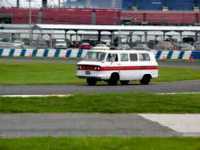 In case you didn't know, the "autocross" course was one lap of the infield section of the Daytona speedway. The course start line was about 20 feet back from a ninety degree left hand turn onto the track leading onto a straight down to the first 180 degree corner, then down a long straight to a slight left hand kink, another long straight, then the second 180. From there, a mild pair of S bends led you past the timing table for the finish. Warren LeVeque's first two runs had looked good, the second time he had improved to a 58 from a 61. Usually that means the driver might pull out another second with a good run, so when he came to the line we knew this was going to be a great show, and likely a very close finish. As he waited for the flag, it looked like disaster - some light smoke was wafting up through the Yenko deck flaps. Ray Sedman ran over and yelled in the cockpit, pointing at the rear deck. Warren twisted around, then waved him off, seemingly deciding that since there were no flames visible that this wasn't really a concern. 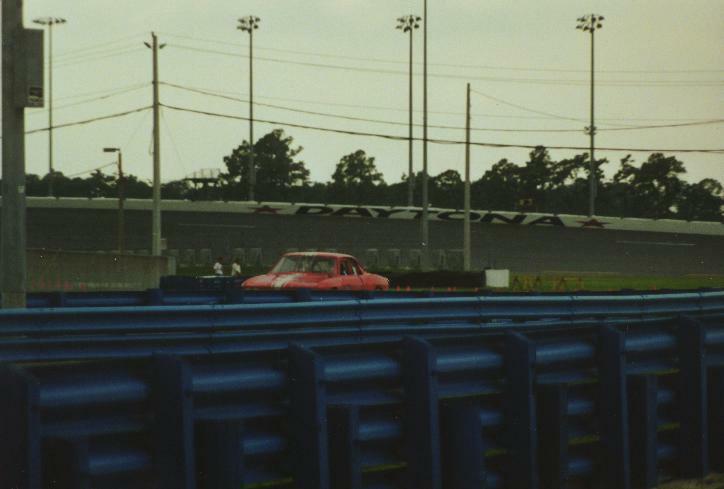 The green flag waved, and as turbocharged power did it's best to repeal the laws of physics, the red Stinger came off the line clawing for traction, drifting through the first turn onto the straightaway. Down the back straight we could hear the engine straining for all it was worth, then a sound we hadn't heard before - a sharp series of backfires. Since that was also the braking point for the turn, it wasn't clear if the engine had a terminal problem or just a minor stutter. Through the S bends, the car was coming toward us, so we couldn't really hear the exhaust but it still had good momentum. So the engine hadn't completely blown up, we knew that. Through the clocks - and the crowd paused, waiting for the time. A 55! Yow, what a run! Watching the Stingers charging around the track, capped by a wonderful set of final runs - this was great! But just like the ads on TV, there was more! The rain was still not quite rain, so the IS classes, including our Greenbrier, were up next. We were told the track would be closed promptly at 5, plus the rain threatened, so we all hoped we would at least get one run in. In my class was Richard Jenkins lovely GB, El Presidente Domzalski's 140 Rampside, and me. Richard got out first, and turned an 88, pretty good we thought after watching the Stock classes and considering the track was slightly damp. I missed Mark's first run, but I figured he had the truck to beat. Now remember that 68 mph top end? 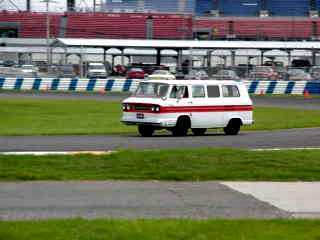 Well, after watching the other Vairs out on the track, I knew that was going to be a problem out on that long back straight, but I thought I'd at least keep the others as honest as I could. First run, the GB accelerated, er, gathered speed, well, um, it was liesurely. On the bright side, the handling and braking were pretty good. 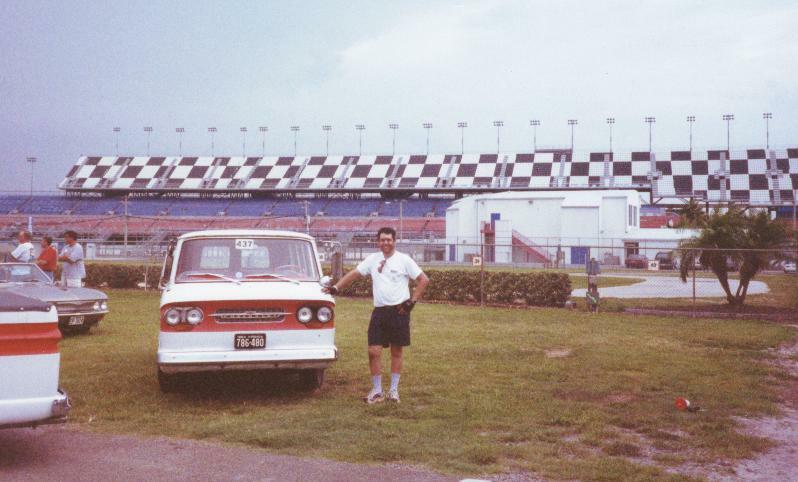 Besides, I was here for the thrill of driving on the track, right? Then I got the time. 101?!? Alrighty, fold back the giant mirrors, start thinking about braking points and let's at least make it look like I meant it. Next time out I looked for time in the only place I could, braking as late as I could, and as little as possible. The GB sashayed through the S bends a little, and I got the time down to 96. A little better anyway, so the final run I tried more of the same and found another second of time in the brake zones. Well, I guess a 95 is a good number for an FC :-) As I'd thought, Mark Domzalski won the class with a 83, and Richard had shaved off a bit to get to 87. Coming up to the start. How's that for a background? The Vairs ran right up to the end, I know a few folks didn't get all their runs in, but most got at least one before the track was closed. Back in the pits to pack up, the rain that had held off all this time came pouring down - you couldn't even see all the way to the other side of the track. I loaded up all my gear and looked around, not likely to forget this Corsa autocross. Finally, the rest of the story. Of course Saturday night is the banquet, and we had planned to attend, I must admit with a hope of hearing our names called for the Rally. The program had Bob Marlow as MC, and he does a great job of keeping things moving along through the various awards and trophy presentations, along with help from various presenters for many of the awards. After listening to much of the program, we came to the Rally awards. Our friend Allen Bristow was presenting, and he started the Touring class with the fifth place trophy. We had thought we probably did better than fifth, so no problem that it wasn't us. Then fourth, hey, not us either. Here comes third, bet that's it. Uh-oh. Now he's announcing second and it's still not us. Wait, we were shut out? Ellie and I looked at each other. Bummer. Then Allen says "And in first place, our own Bryan Blackwell and Ellie Blackwell!" Yahoo! What a day! Yup, that was it. For the entire trip, the van behaved itself and carted us to and around Florida, then back home for a vacation that couldn't be beat. 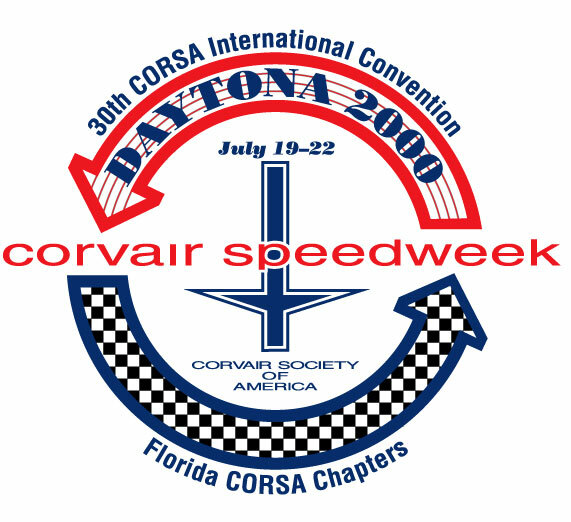 Of course, it wouldn't have been anywhere near as much fun without an absolutely terrific convention to go to - and a special thanks from us for the congrats in the program from the Florida Corvair Clubs. We couldn't have asked for a better way to celebrate ten years!